Let us sing the praises of Linode, a provider of cloud-hosting for Linux-based applications and web sites. At work we’ve had two of these for a year, and they just work, exactly if the servers were sitting in the next room, except that they provide a slick management interface, and you can mix and match among different disk sizes, RAM, processors, redundancy, and various flavors of Linux. Access is via their web site, or via a secure terminal session. Here’s a shot of the backup screen, (click to enlarge). 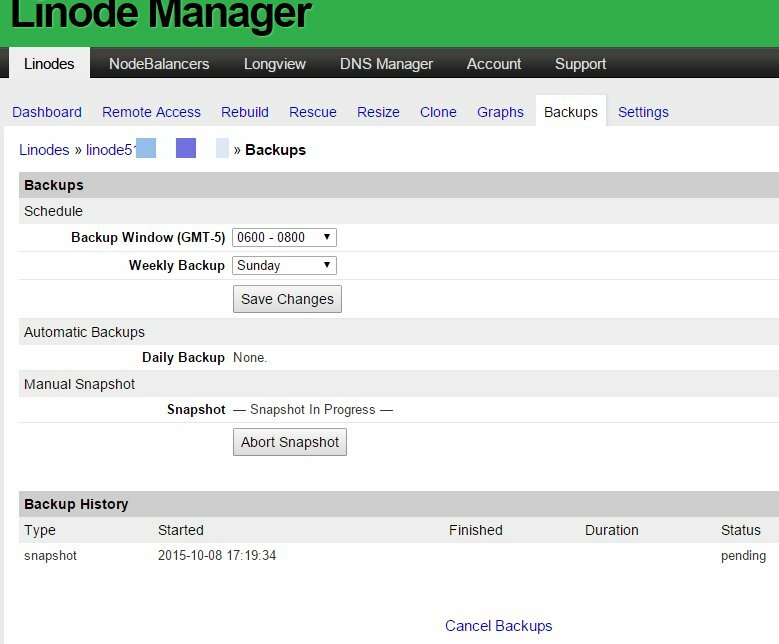 The Linode-provided backup is great for basic backup. It makes backups on a weekly and daily basis. It also has a provision for a snapshot, which is a great way to back up the server before doing upgrades. Full details are on their web site, including the costs, which are a few dollars per month depending on the size of the Linode. There are some limitations…for example with MySQL database transactions. Linode recommends that you perform a data dump of your MySQL data so that the dump files get backed up. This entry was posted in Uncategorized and tagged http://schemas.google.com/blogger/2008/kind#post, Linux, Networking, Shell on October 8, 2015 by lkeyes70. Two thumbs up for Linode! Undoubtedly one of the hosting providers right at the top. I’ve been using Linode with Cloudways (www.cloudways.com) since they launched it a few months ago and am extremely satisfied with it !